One of the enhancement requests recently posted on the Stamporama Discussion Board was to be able to set a flag on the Stamporama Invoices that are sent to you to indicate that you have paid the invoice. The Stamporama Invoicing system has been enhance to enable this. 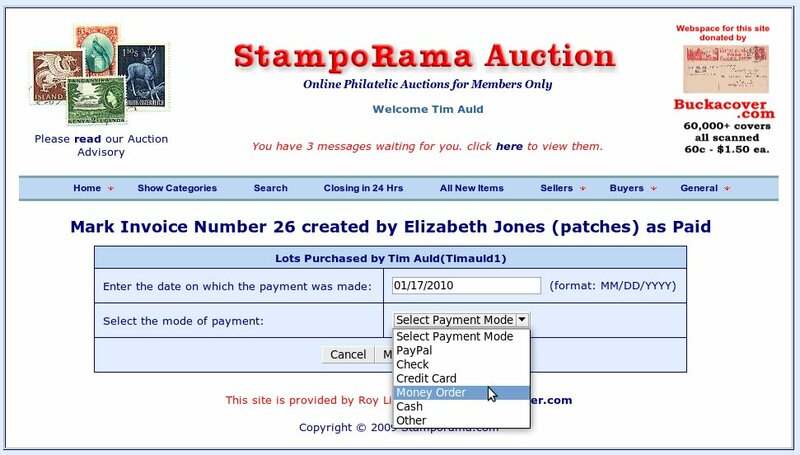 Under the Buyers drop down menu on the Stamporama Auction screen you will find the My Invoices option. Select the My Invoices menu option and the program will display a list of the invoices that you have received for the auction lots that you have won. In Figure 2 above you can see that the first three invoices have been marked as paid. Click on the Date Created in the first column to enter the invoice. In Figure 3 you can see the detail of the invoice. If you want to see a copy of the original invoice exactly as it was sent to you, press the View Invoice (Printer Friendly) button. To mark this invoice as paid, press the Mark as Paid button and the following screen will be displayed. On the Mark as Paid screen, enter the date on which you made the payment (it will default to today's date) and select the Payment Mode. Then press the Mark as Paid button. As you can see in Figure 5, the invoice is now showing as paid using a Money Order. 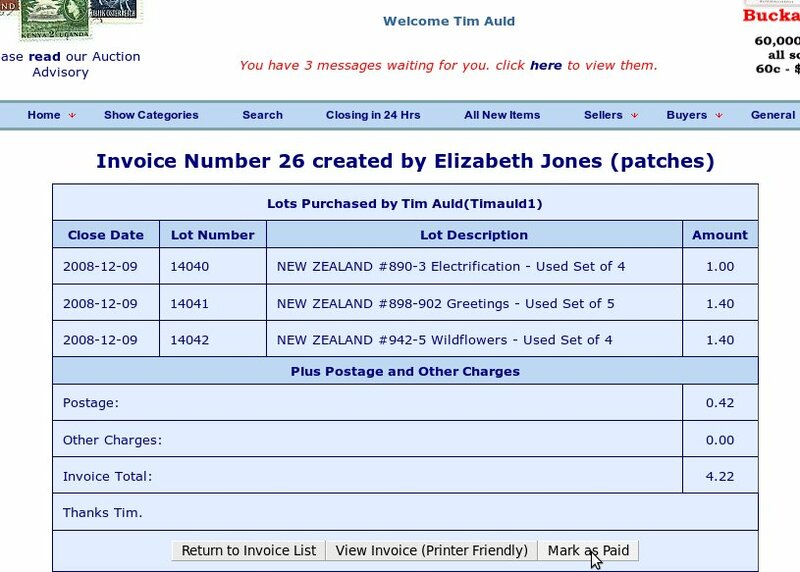 In Figure 6, we take a look at the list of invoices sent out by the seller and we can see that the payment is visible there also. I hope you find this function fun to use and that it helps the communication between the buyer and the seller.